We have to play the cards we’re dealt. Like it or not, this is the environment we’re forced to invest in, but only if you want to. You don’t have to invest. Cash has been a viable option for six months. It’s worked out great. Most stocks, sectors, U.S. and international indexes are still below their January 2018 highs. We’ve been in a 14-month sideways range, or downtrend, depending on who you ask. Either way, it’s not an uptrend for most stocks. Now, this 14-month nothing burger comes within the context of a major bull market in stocks, that arguably started in 2016. After a monster run throughout 2016 and 2017, the stock market, both U.S. and abroad, has consolidated those gains. It seems perfectly normal, and well deserved, if you ask me. So what if this takes another two months? Or three months? Or more? Is it the fault of the president of the United States? Is it the Fed’s fault? The media’s fault? This is the current market environment that we have upon us. They’re going to try their best to distract you with stories about China trades and Fed rate hikes or something they call the Mueller report. Why should we care about any of these things? We don’t. And shouldn’t. It’s gossip. How about 14-plus months of basing? How about 20 months? Until we break out, cash is still a viable option. And it’s been working! Below is a video I recorded at the Chart Summit in late February. At that point we were seeing more new 52-week highs on the NYSE than we had seen in over six months. What we’re looking for is simple. We want to see an expansion of stocks, sectors, U.S. and international indexes breaking out above their January 2018 highs. Right now, just a tiny fraction have done so. 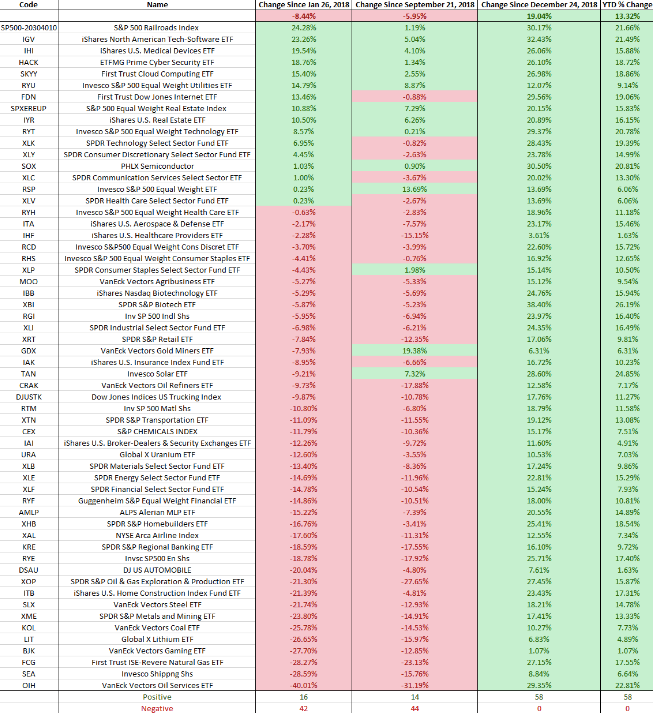 In the sectors and subsectors, performance year-to-date and since the December lows remains overwhelmingly positive, however, only 16 of them are positive since the January 2018 highs in the S&P 500. A slight improvement, but nothing to write home about. The more stocks and sectors we see breaking out, the higher the likelihood, and the sooner we’ll see the major indexes like the S&P 500 and Dow Industrial Average making new highs as well. For me, it’s more about the internals themselves. 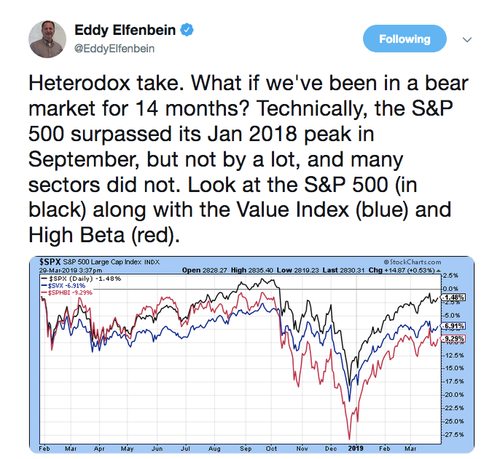 I think Eddy is right, we’re in a 14-plus month cyclical bear. BUT, I believe this comes within the context of a secular bull market. More importantly, based on any historical measures, this is perfectly normal behavior. How long will it take? I don’t know. No one does. It could take another six months. The point today is that we’re looking for an expansion in breadth. While we’re not seeing contraction, things aren’t improving either. Things are mostly just a mess. Not all markets need to be trending at all times. It doesn’t have to be an uptrend, and it doesn’t have to be a downtrend. We can be somewhere in the middle. How do you feel about the current environment? Let me know at bigmarkettrends@charlesstreetresearch.com.